this skirt. I’m in love with this skirt. I love how it feels and fits, I love the subtle sheen of the fabric, and I love how it is both classic and unique at the same time. It’s going to be a favorite for work. this top. I wear this style over and over again with everything (jeans, skirts, trousers). The key is that it has a longer skinny sleeve – so flattering and comfortable. I just bought this cream one in even nicer fabric – it will be on repeat for sure. these heels. The color of the coming season. It is such a striking, stunning color in person – rich and muted simultaneously. My new neutral pump. My must-have list at Nordstrom, conveniently in one outfit. Thanks for stopping by!! This look is so wonderful grown-up! Always a lovely vision! ???? 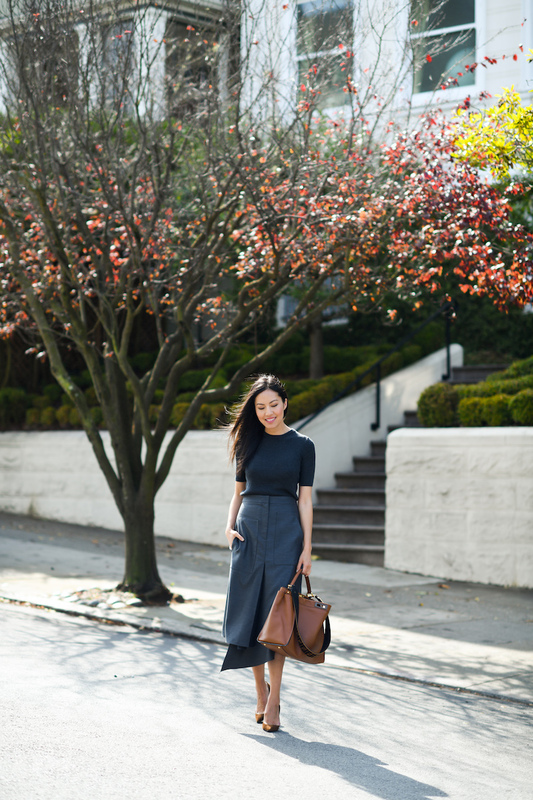 This outfit is so chic and perfect for work! This skirt is sooo beautiful! <3 🙂 It's super elegant and sophisticated!